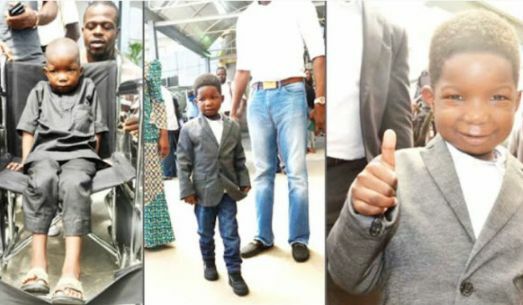 There was joy at the arrival terminal of the Nnamdi Azikiwe International Airport, Abuja on Monday as family members and well-wishers gathered to receive Ali Ahmadu, a six-year-old boy from Chibok in Borno State, who was left paralysed by Boko Haram insurgents. About three months ago, Ahmadu was flown to Dubai for a corrective spinal cord surgery after he was overrun by insurgents’ motorcycles when they invaded Chibok community in April 2014. But on stepping out of the arrival terminal, Ahmadu, who was being moved around on a wheelchair some months ago at the airport, ran to the waiting arms of his uncle, who hugged him. It was gathered that Dickens Sanomi Foundation, a charity organisation based in Abuja, paid $48,000 with the support of Senator President Bukola Saraki for Ahmadu’s medical trip after the Global Initiative for Peace, Love and Care organised a fund raiser for the child’s corrective surgery. Speaking on behalf of the GIPLC, Mr. Nuhu Kwajafah, said, “Ahmadu was immobile and fast deteriorating, physically and mentally, from 2014 till the first quarter of this year when the GIPLC made contact with him. The organisation facilitated the relevant examination and laboratory tests for assessment and proper medical attention. Kwajafah said the GIPLC was committed to Ahmadu’s post-surgery well-being and had received confirmation from Dickens Sanomi Foundation to support the child, as well as provide him scholarship. In a similar development, the Abuja Breakfast Club donated food items to less privileged persons at the Victorine Home for Children in Gwarinpa, one of the satellite towns in the Federal Capital Territory. The President, ABC, Mr. Finnian Allagh, while making the donations, said, “The objective of setting up the club is aimed at giving back to our society, to advance brotherhood, increase the level of friendship and most importantly, impact positively on the community we reside in. We hope not to just impact our community but promote brotherliness among Nigerians.